"Use embossing - dry / heat "
"Lizabeth wild daisies" from Lacy Sunshine. and I really liked the backing paper. It was JUST long enough to fit! The sentiment was a freebie from Desert Divas. and the edge of the white card. Hippie girl is very pretty. 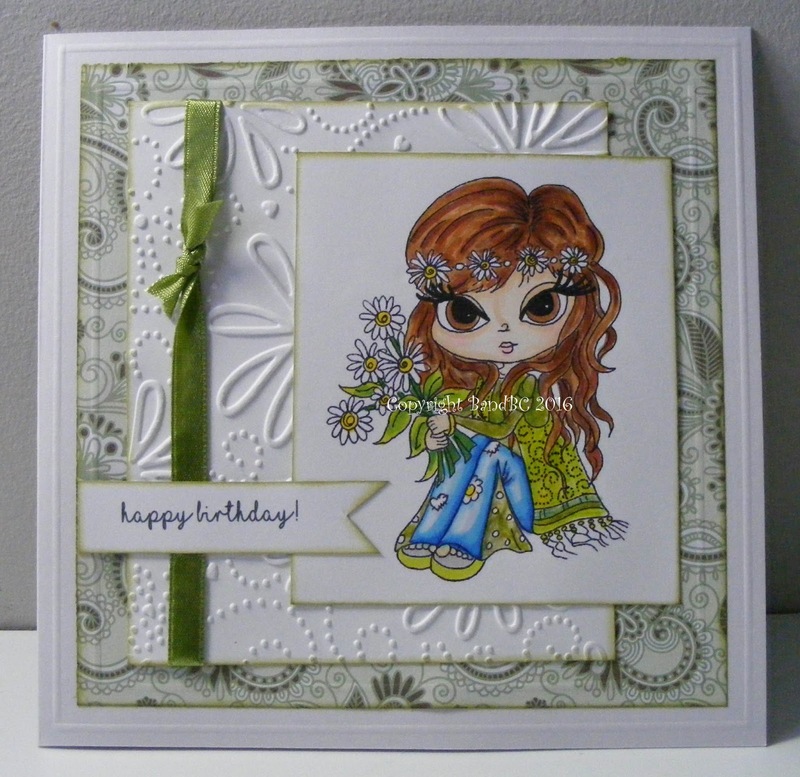 And for sure this backing paper matched the hippie theme perfectly. The embossed lines with the embossed layer really make this pop! And the image is just precious - great coloring job! TFS! So cute! Love all the textures and your image is adorable! Thank you for joining us at TTCRD! Beautifull card, love the embosed part!! what a lovely layout and your dry embossing was an excellent choice. The colors work so well with our challenge at House of Cards. This little girl is so sweet and priceless, I just adore her.. Thank you so much for joining us and do hope to see you this month for our shaped card challenge. Take care. Fab image and love the texture on this beauty. Thanks for sharing your talent with us at Brown Sugar Challenge. We look forward to seeing you again. Great card! I love all the greens! Thanks for joining DTBST challenge! This is so beautiful, Vic! Love it that you're playing along with us at QKR Stampede this week. Good luck in the draw. Beautiful creation! I love design and image! Wonderful colouring!